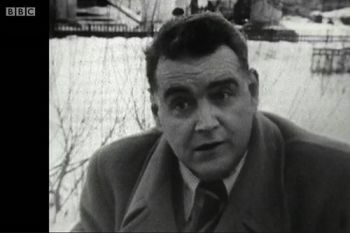 The only known television interview with Guy Burgess, one of Britain's most notorious traitors, was broadcast in the UK for the first time in an exclusive Newsnight report by City's Stewart Purvis. The Professor of Television Journalism explained the significance of the footage for the BBC Two programme on Monday 23rd February. The 1959 interview - which remained hidden in archives for more than 50 years - brings to life the colourful cold war spy, who defected to Soviet Russia in 1951 but claims in front of the camera that he is not a traitor. It follows the discovery of the only known audio recording of Burgess in 2013, when Professor Purvis and Jeff Hulbert, an Honorary Research Fellow at City, obtained a tape from the FBI through a freedom of information request. When it came to the end of the interview he pleaded with me, he said, 'For God's sake, please help me get back'. The researchers, who are writing a biography about Burgess, say the footage provides a valuable glimpse of the spy's character and his desire to return home to Britain. It is thought to be the only time any of the Cambridge spies gave a TV interview to the Western media while in Moscow. Speaking on Newsnight, Professor Purvis said: "There are no mentions of this interview in any British newspaper of the period, or on British television or radio. There is nothing about it in any government files that we can find. "It suited both the British and Russian governments that this interview was never shown again and has lain in the archives ever since, because by then, in 1959, Guy Burgess had become an embarrassment to everybody." The interview shows Burgess for the first time as a real person, rather than someone constructed solely from the diverse recollections of others. The video was discovered when an archivist from Canadian Broadcasting Corporation (CBC) recognised Burgess's name on an old reel following the worldwide coverage of the FBI tape story. CBC then contacted the City researchers to check the authenticity and significance of the finding. After detailed research, Professor Purvis and Jeff Hulbert concluded there was no other record of the film. The footage was shot by freelance filmmaker Erik Durschmied in Moscow in early 1959. 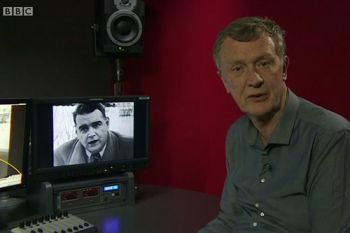 Burgess's answers were then edited into a mock interview with a host at CBC, which broadcast the footage in a magazine programme called Close-Up on 11th March 1959. Jeff Hulbert (left) said: "This footage was a completely unknown gem from the cold war years. We knew nothing about it, although always suspected that something like it might turn up in the future. "The interview shows Burgess for the first time as a real person, rather than someone constructed solely from the diverse recollections of others." To read Jeff Hulbert's extended analysis of the television interview, visit City's microsite on the academics' Burgess research. Newsnight host Evan Davis spoke to the filmmaker Erik Durschmied during the programme and asked about Burgess's state of mind. "He was so isolated, so lonesome, so bored… that when it came to the end of the interview he pleaded with me, he said, 'For God's sake, please help me get back'," explained Durschmied. "I said, 'look… you're considered to be a traitor and you're going to go to jail'. And he says, 'I wouldn't mind. I wouldn't mind at all'. "That was my impression - that he was a burned-out case." Watch the Newsnight report on the BBC iPlayer (available until Monday 23rd March 2015). The interview is available to watch on the CBC website. The report was filmed at City University London and the BBC and was made by 1212 Prdouctions, directed by Philip Armstrong-Dampier.